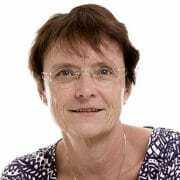 After Astrid Kuhlmey has been working in middle management and in international project management in the pharma industry for more than thirty years, she became a freelancer in 2013 as a consultant for project and change management as a coach and mediator. For over ten years, she has been continuing her training in the areas of systematic consultation, mediation and project management as well as about themes of cooperation and organization. With her colleague Matthias Winnig, whose professional focus is on bodywork as well as the application of the universal principles of coaching, she has worked out an approach to connect bodywork with systematic techniques and attitudes with the goal of achieving security from inner stability. How do you deal with uncertainty from technology? Can VUCA be fought with rationality? No, says Astrid Kuhlmey, and instead she recommends self-awareness. A project always has something to do with uncertainty. How do you approach uncertainty and which skills can you learn for dealing with it?